ABSTRACT: Seven new species and a new genus of deep-water agglutinated foraminifera (DWAF) are reported from the Upper Oligocene of the Congo submarine canyon area, offshore Angola. 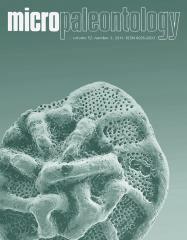 The new taxa Ammodiscus kenderi n.sp., Haplophragmoides volati n.sp., Ammobaculites duponti n.sp., Spiropsammia primitiva n.sp, Tetrataxiella subtilissima, n. sp., Discamminoides evolutus, n. sp., and Plectoverneuilinella angolaensis n.gen., n.sp. (belonging to the new family Plectoverneuilinellidae), are described herein. The new species are sometimes common components of a “flysch-typeâ€ agglutinated foraminiferal assemblage associated with deep marine clastic sediments.